China, the number one destination for all U.S. soybeans, has stopped buying because of the President’s trade policies. Normally those bushels would be exported via the PNW (the Pacific Northwest) grain export terminals. That gate has closed says NDSU’s Frayne Olson and now all those bushels are expected to try and move through the other export gate at the Port of New Orleans. If you look at a fall 2018 map of soybean prices across the United State you can see how grain flow is backing up into the St. Louis export terminals. The PNW can handle about 25 train loads of soybeans a day. St. Louis can manage 5. Because of this, cash prices from the Dakotas all the way to Illinois River - it feeds the export market & St. Louis - are miserably low. Those farmers east of the Illinois River are impacted, too. 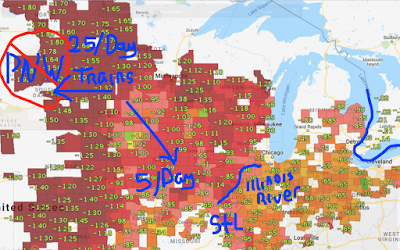 If the map includes Canadian export terminals you can see that farmers in far western North Dakota are getting a $1.90 a bushel less for their soybeans than their counterparts near London, Ontario. Farmers in parts of Illinois, Indiana, and Ohio are getting about 60 cents less.